Christmas gift plants – azalea, Christmas pepper, Christmas cherry, Christmas cactus, cyclamen, begonia, amaryllis and poinsettia – will stay attractive long after the holiday season is over, provided you know the conditions and care they require. All plants, for example, share similar care instructions: all require bright light – but rarely direct sunlight – all prefer cool rooms (around 65 degrees) that get even cooler at night, and all need watering before the soil is dry to the touch. After bringing the plants home, removing the metal foil the plant was wrapped in at the store or greenhouse will contribute to the long-lasting beauty of the plants by allowing for adequate drainage. I often repot the plants in pots that are slightly bigger to allow for more growth. It also suggests the permanence of the plants in my collection and inspires me to care for them a little more carefully. Be sure to feel the soil to test its dryness. If it is dry to the touch, give the plant water until it drains out the perforations at the bottom of the pot, making sure the soil is thoroughly soaked. This is one of my favourite plants of all-time. Its tall, slender stalk reaches up to reveal huge, trumpet-like flowers that will take your breath away with their beauty during the holidays. 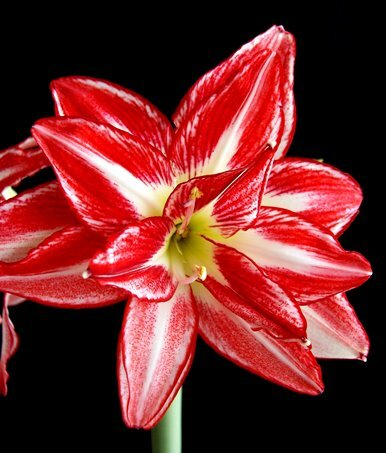 Amaryllis is native to Africa and is one of the few holiday plants that thrives in direct sunlight. A south-facing window with full sun is best for the amaryllis. If you want blossoms for Christmas, plant the bulb in early November. When planting the bulb, be sure to place the soil only halfway to three-quarters of the way up the sides of the bulb’s surface; the bulb requires a few centimeters of exposure. Never completely bury an amaryllis bulb. They prefer small, constricted pots, but enough room to set down roots. Water thoroughly after planting then do not water again until the leaves begin to show. Gradually begin watering again – a small amount once a week is plenty - once signs of growth begin to show. The plant will grow quickly. In a few weeks you will have beautiful blooms. When the blooms fade, cut the stalk. If you wish to preserve the bulb until the following year, allow the leaves to grow throughout the year. The following autumn, cut the leaves and place the bulb in a cool, dark place for two months. Then, replant it and expose it to the sun; you should get a second round out of it! The blossoms on an azalea will last long if plants have bright light during the day and cool temperatures at night. Keep a constant, even supply of moisture to the soil – the flowers will wilt and die prematurely if the soil becomes too dry. Soak the pot in water on occasion so that water penetrates deep to the core of the roots. Remove the old flowers as they fade. To keep your plant growing, fertilize with acidic azalea fertilizer every month, beginning the time the flowers fade in the spring until the new buds form; never fertilize while the plant is flowering or in full bloom. I find it difficult to keep azaleas indoors, to be honest. They are so sensitive to dryness. With the heat on during the winter months, the room's moisture becomes consistently dry, making it inhospitable to the plant. You could set up a humidifier to moisten the air in the house, but I always ask myself if an azalea is worth the effort. Usually, the answer is no. The Christmas Cactus is actually not a cactus at all. It is a succulent and therefore requires even moisture throughout the year. It enjoys bright light but not direct sun. An east or west facing window is best. The plant will begin to bud in mid-November and flowers could last as long as three months with proper care. I've even had summer blooms on my plant! Many people complain that their Christmas cactus never blooms again. This is likely because they don’t realize that the plant must be subjected to minimal exposure to light and no water for at least one month prior to the time you wish the plant to bloom. The plant will always bloom after a period of stress. If you want blooms for the holidays, remove the plant from its usual spot and place it in a dark corner for one month, neglecting to give it water during this period. Once the month has passed, bring the plant back to its usual bright spot and gradually begin watering it again. Within a few weeks, you will see numerous buds begin to appear. 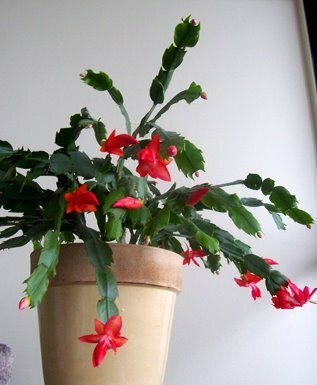 Christmas cactus can be forced to bloom at any time during the year using this method of stress, but be sure not to get too greedy or the plant will give up. It requires consistency most of the time. As the blooms fade, remove them; this may further the flowering stages. For the rest of the year, keep the plant happy with even moisture and bright light. These plants are less common now than they once were, replaced by the more exotic amaryllis and cyclamen in recent years. If you do find them, they are usually reasonably priced. The plants’ attractive foliage and colourful fruits and blossoms make cheerful additions to a holiday décor. To prolong their beauty, give the plants bright light and cool temperatures. An occasional mist of water keeps the foliage looking its best. Treat pepper plants as annuals – throw them away when they become unattractive as they are not likely to refurbish their blooms or fruit a second time in a pot. You can dry the peppers and use them as seasoning, but be warned that they are very hot! Both Christmas peppers and Christmas cherries are easy to grow from seed. Plant the seeds in pots in the spring and put them in a sunny spot – even outdoors, if you prefer. Move them inside before the frost and you should have fruits by Christmas. Cyclamen is a fussy but lovely addition to a holiday collection of plants. Their flowers are almost angelic as they bob weightlessly from tall, slender stems. They come in a myriad of colours, also: dark pink, light pink, variegated pink, deep red and plain white. They are native to the mountain ranges of the Mediterranean and Asia and like cool environments that simulate a forest floor: moist, cool and limited exposure to sunlight. These plants do not have roots, but tubers. As such, they are easily prone to rot. Water them frequently but carefully. Never let the soil dry out but never let it get soggy either. Water them with small amounts at a time two times a week. Keep them in an east, west or north-facing window and make sure to keep them away from dry air vents, fireplaces and heaters. 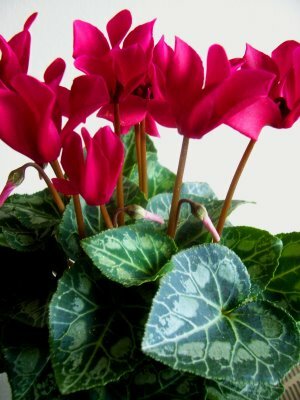 The flowering stages of cyclamen vary slightly. They are unlikely to bloom a second time in your home, although my grandmother has been blessed with a cyclamen that has never once stopped flowering during a two-year period! You may wish to discard the plant after the flowers have passed, although the foliage is quite nice. This plant thrives under good light and with only average care. It has above-average lasting quality and is characterized by its dark green foliage and orange, red or salmon-coral flowers. To lengthen the blooming time to several weeks, select a plant in the half-open bud stage. It will do best if you keep it just barely moist. Once winter has passed, these plants enjoy the outdoors in warm weather. If you are repotting them, grow them in pots with generous amounts of peat moss. 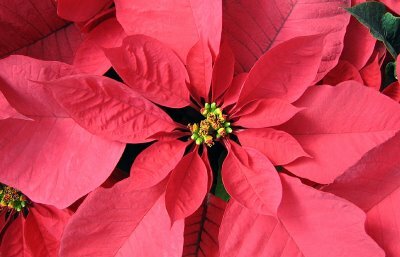 Native to Mexico, poinsettias are, without a doubt, the most popular holiday plant in North America and Europe. Millions of these plants are sold each year during the Christmas season. Newer varieties are lasting longer than ever and are also less sensitive to drafts and temperature extremes. However, temperatures above 75 and below 65 are not recommended for the poinsettia, which enjoys a moderate, consistent warmth. It likes bright, indirect light most of the time. Direct sunlight should be limited to only four or five hours a day. Water them consistently but modestly; they are not big drinkers but do enjoy evenly moist soil. The ‘flowers’ of the poinsettia are not flowers at all. The colourful sections of the plant are called bracts, which change colour with a change in light exposure, much as deciduous trees change the colours of their leaves in autumn. Growers of poinsettia place the plant in 14 hours of darkness each day between September and October in order to induce the plant to change the colour of its bracts, which surround the flowers: those tiny, yellow-green buds at the center of the bract formations. They will last as foliage plants for years after you first purchase them if properly cared for, but it is very difficult to get the plant to change colours again without the proper facilities.